Get your Kazakhstan holiday custom-made by a vacation planner that know what the guidebooks don’t. Kazakhstan borders China and Russia, and it´s huge. It´s the richest of the ´stans, so the standars are higher than the surrounding countries in regards of accommodation, transportation and food. Visitors tend to stay around the city of Almaty while here. It´s the biggest city, the former capital and even though it´s built in Soviet-style, it still has a European feel. It remains the cultural and financial hub of the country and has luxurious shopping malls, expensive restaurants and glitzy nightclubs. And the Green Bazaar that gives you an insight into what the Kazakhs eat. 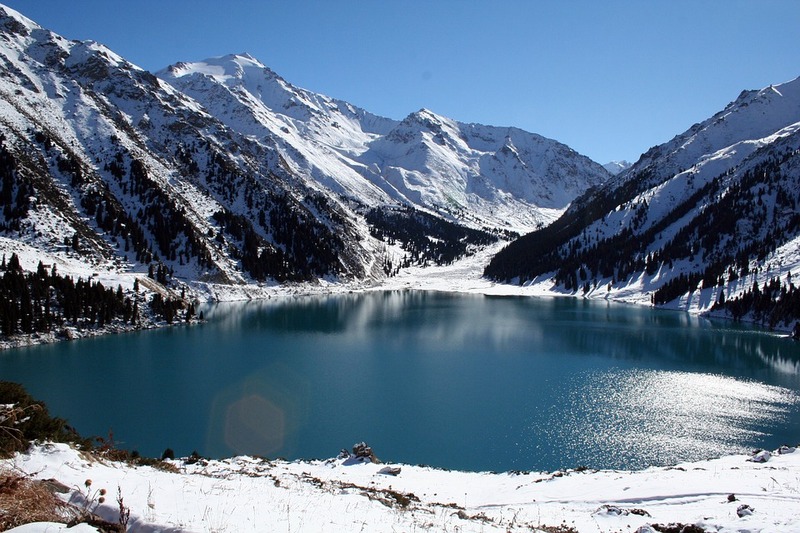 Almaty is on the doorstep of Tien Shan. This mountain range with rivers, glaciers and high peaks, is paradise for hikers. It is also home to the beautiful, turquoise Lake Kaindy, unique because of the spruce trunks rising from the water. And of course the three Kolsai lakes located at 1800, 2250 and 2700 metres above sea level, with an amazing plant and animal life. In the north-western parts of Tien Shan is Aksu-zhabagyly nature reserve, home to hundred of plants like the wild tulips, birds and mammals including the rare snow leopard and the white-clawed bear. You can hike, go horse back-riding, swim in what the locals claim is healing waters and enjoy the hospitality in a Kazakh style homestay. Here you will get a taste of what the locals eat and drink. Beshbarmak is a stew, usually made from horse meat. And koumiss is fermented mare´s milk, sometimes camel milk in the outlying regions. If you prefer water, try drinking the clean mountain water of Turgen Valley right from the river. Turgen Valley is a mountain pass to Assy Plateu. The plateu is used as pasture for cows, sheep and horses. You can go by horse or bicycle and you will meet shepherds and pass yurtas, nomad´s tents, on the way. In the Almaty province you´ll also find Charyn Canyon, sometimes referred to as Grand Canyon´s little brother, but described as just as impressive with it´s 154 kilometres. It you choose to stay overnight, be sure you don´t miss the sunset and sunrise which is said to be quite amazing. Winters are great in Almaty. For a fun winter adventure visit Shymbulak, a modern ski resort just 30 minutes outside the city. Or nearby Medeu, the highest ice skating rink in the world. Tamgaly Tas is just north of Almaty. This UNESCO World Heritage site consists of mysterious Buddhist rock carvings and paintings from the Bronze age onward. It is one of Kazakhstan´s top attractions. Astana, the capital, is a new city and grows rapidly. It may not be as exciting as Almaty, but it has some pretty great buildings for those interested in architecture. Like the Bayerek Tower, a tree-shaped tower crowned with a gold mirrored sphere. The gold-capped Nur Astana Mosque in Astana. And the Khan Shatyr, a tent-shaped building designed by Norman Foster. Most of Kazakhstan is endless and sparsely populated steppes. And attractions are mostly in and around the cities. But for those interested in Soviet history, archeology, botany or birdwatching, you may want to go further. For example to the Baikonor Cosmodrome where Yuri Gagarin was launched into space as the first human. Or the beaches along the Caspian Sea. Or one of the ancient desert cities along the Silk Road.